Founded in London in 1920 with the aim of revolutionizing dance education in the UK, RAD is now a globally recognized and highly respected institution for ballet and dance education, including teacher training. Not only does RAD encourage theoretical understanding and appreciation of dance as an art, but its education and training is unique, its curriculum especially adapted at each stage to complement students physical and intellectual development. RAD has also developed its own examination system for each stage, not only providing student with personal satisfaction with their achievements, but internationally recognized dance qualifications as well. During its existence RAD has continually improved the quality and validity of its work, so that it has enlarged its work to cover schools in over 79 countries worldwide, where its exam preparation syllabus is taught by RAD trained teachers to more than 250 thousand students. Ana Došen is a dance professional with over 16 years experience in theatre performance and ballet teaching. 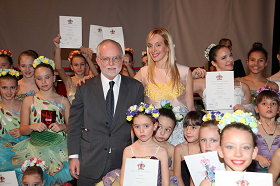 She founded her ballet school ASD in 1998 which since 2011 has been the first and only ballet school in Serbia to prepare students and provide a registered venue for Royal Academy Of Dance examinations. She is fully committed to promoting and teaching ballet at the highest level. The school offers an internationally recognized portfolio of examinations and assessments as well as a curriculum for students who wish to improve their physical posture or to learn ballet as a recreation. At each stage the syllabus has been designed to follow Royal Academy of Dance standards, motivating and encouraging pupils, ranging from tiny tots to teenagers, in a specific, systematized, measurable, and enjoyable way.